Be worry free with this Medique 729P1 small first aid kit. Perfect for your office desk drawer, car, or travel bag, this space-efficient first aid kit contains everything you need to treat cuts and scrapes, as well as pain, headaches, or indigestion. Perfect for people on the go, this item is great for caterers and event staff to take along to off-site functions. These kits pack away easily so you always have first aid supplies available, wherever you are. The first aid kit comes in a lightweight plastic container, so you won't even know it's there until you need it! In a small baking business, there aren’t many injuries to be had if you are safe, but minor things do happen. This compact kit is sufficient for those minor things. It’s a good quality item at a good price. This 35 piece small travel first aid kit is great! The small size makes it easy to have in the car or even in the office. I use it in both locations and always feel prepared. Everything you need for a tiny kit in this case! Very reasonable price and comes with bandages, antiseptic, pain reliever, wraps, and more. Why pay more? This 35 piece medique travel first aid kit is the perfect size for your car. It comes with everything you could need. It’s such a great price and I would highly recommend everyone keep one of these in their car. Great first aid kit for the car! Comes with everything that you need. It's also perfect for traveling or for your office! Great price for a great buy! Happy with this product. Very durable material that is great for what I need it to do. Like the box and packaging it comes in too. This is a great first aid kit for the car everything you need except an antibiotic ointment. The bandaids are all the same standard size but there are gauze pads and tape for larger cuts or scraps. The medique small travel first aid kit is good for keeping a compact selection of common first aid supplies. The case is easily identifiable and durable for transport. This little first aid kit is a great deal. it is sturdy, compact, and has a lot of the sorts of things you need. I especially like the inclusion of hydrocortisone cream. My only issue is that it doesn't include any triple antibiotic ointment, only wipes, but for the size and cost I am very happy with it. Everyone needs to have a first aid kit in their car. You never know when something bad could happen. These include just about everything that you would need in any situation. 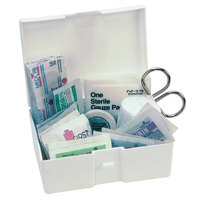 You can' t beat the quality and value of this Medique small travel first aide kit! Everything you need on the go in a neat little plastic container! This is a great product to have. At a very convenient price, it's a steal. You get 35 various items in an easy to store container. I keep mine in my glove box. Love this! This first aid kit is the perfect addition to my car. It fits nicely in the back pouch of the seat and has all the right medical supplies in it. Would definitely recommend that everyone keep a first aid kit in their car. So far the only us less thing in the box is the antacids, I have since added it to a more extensive box. It's small and is like a sample pack. The contents in this nice, compact first aid kit are exactly what you need and nothing else. Compact size fits great in a drawer for easy access in emergency. Perfect for our food truck! This is an outstanding first-aid kit for the price. It has 10 different items you might need in an emergency, and the box it comes in has some extra space if you’d like to augment with more items. I like it so much I am going to buy one for my husband and daughters. Fortunately, I have not had to use this kit. (Knock on wood). It was been comforting to have a first aid kit nearby. This is affordable and adequately stocked for most issues. Medique 729P1 35 Piece Small Travel / Car First Aid Kit good item, kinda small but it's supposed to be, I need to order the larger one for our current needs in store. This was nice to get. Medique 35 piece small travel-car first aid kit. This come with most of everything you need and will definitely help if you ever need it! This is a great size kit for me to pack up and take with me when I work at farmer's markets or events away from my kitchen. Great first aid kit with many uses, small enough to carry in backpack, but mostly good to have in your car, many uses for cheap. This product is awesome! It's a great 35 piece travel kit! It holds all of the necessities! It fits perfectly in glove bos of car or under seat even! this is an nice comprehensive little first aid kit. we have it for our break room. it doesn't have quite everything we need, but for a small outfit such as ourselves it gets us by. I purchased this small travel set for my car and now thinks I would like a few more. It comes with a little bit of everything and the question of the products is quite nice. For about the price to buy some bandaids you can have a complete first aid kit. In addition to having one on the car, I keep one in my sewing room. What and amazing value for a complete 1st aid kit. This is great for a store, personal use, or in the trunk of your car. nice small first aid kit we like to have in restaurant. got evey thing we need for that quick fix and was offered at a great price. I love having these in the car. Or in any bag. They are great for the price and you can buy the refill of things at a decent price as well! I love this first aid kit. It has just about anything you would, and is a great price! Great thing to buy your teen to keep in his/her car. This is an all around great first aid kit to have in your cars glove box, to take with you on a trip, or to keep handy in places where you don't have a ton of storage. It's a very high quality kit and has a great assortment of the items you would need in an emergency situation. This is the perfect first aid kit. Just the absolute essentials. I want to put them in every room, and every vehicle. A great way to have piece of mind. This kit is a very good value for the money. It is surprisingly inclusive for the size, and better that what you would usually find at the drugstore. This small travel first aid kit is perfect for keeping in our office in case of a need. The first aid kit comes equipped with everyday needs for small mishaps. This is a great first aid kit for me as a personal chef. Before this kit I had a ziplock baggie with a few things in it, but nothing compared to this. Everything I could possibly need in a small, compact first aid kit. I will order another one to go in my camping backpack. Great find at a great price! This is a very good travel size first aid kit. It includes the basics for minor injuries and scrapes. Considering the price it can be used in every vehicle you own without breaking the bank.